1. Standard – with a straight through eyepiece mount that shows your image upside down and reversed. 2. Right angle – with a 90 degree eyepiece mount that shows your image backwards (mirrored). 3. 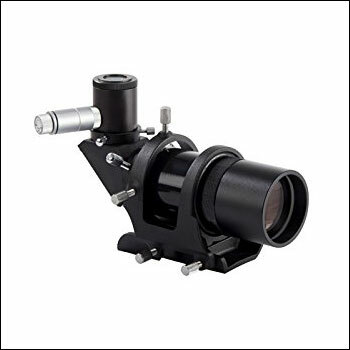 RACI – an illuminated Right Angle Correct Image finderscope has a 90 degree eyepiece mount and shows the correct image (like this Celestron Finderscope, the Orion 9×50 RACI Finderscope or the Skywatcher 9×50 Finderscope). Now that we know what a finderscope does, what makes a RACI finderscope (like the Celestron 9×50 finder scope) better than other types of these instruments? As you can tell from our brief descriptions, a RACI finderscope like the Celestron RACI finderscope show your image correctly – not upside down, not mirrored. Celestron RACI Illuminated Finderscope reviews praise the fact that a great deal of hassle with their telescope was solved thanks to this accessory. In addition to this, the Celestron finder scope is at a great price for a product of this kind, and generally more appreciated than its competitors (like the Orion finderscope). It is noticeably less expensive than the Orion finder scope and is one of the best-selling Celestron telescope accessories in this category on Amazon. Celestron company reviews support the quality of this product, which will work with a wide range of scopes, such as Celestron Nexstar telescopes. Most customers choose Celestron finderscopes as alternatives for the ones that their telescopes come with, also browsing other products like a Celestron telescope eyepiece, a Celestron 6×30 finderscope, a Celestron polar finder or a Celestron finderscope bracket. The good news about the Celestron RACI Illuminated Finderscope is that it comes with a bracket incorporated, so you don’t need to buy one separately. However, it is best if we take a complete look at what this finderscope can offer, which we shall do in our full Celestron RACI Illuminated Finderscope review below. 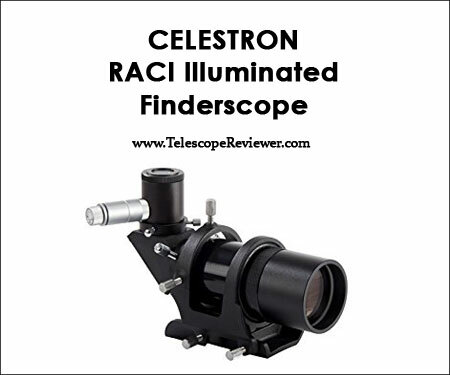 What is the Celestron RACI Illuminated Finderscope? To put it in a nutshell, the Celestron RACI Illuminated Finderscope is an affordable RACI (Right Angle Correct Image) finderscope designed and manufactured by Celestron, meant to ease the process of targeting celestial objects. It is a 9×50 finder scope that is 9.4 inches long, 7.1 inches wide and 3.5 inches tall, which weighs around 24 ounces. The Celestron RACI Illuminated Finderscope requires one lithium ion battery to function (which is included in your package if you order the product on Amazon). It has a dual crosshair reticle that lets you center your target without any further issues. Moreover, it can be rotated both right and left according to your comfort and preferences. 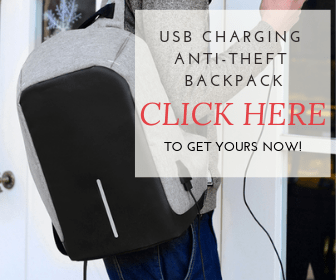 It is generally regarded as an excellent product from customers, with positive reviews, except for the fact that the package comes with no instruction manual and you cannot find one on the official Celestron website, either. Aside from this, individuals who purchased the Celestron RACI Illuminated Finderscope are thrilled that they found a reliable RACI finderscope at such a low price. But what exactly are the advantages and the disadvantages of buying and using the Celestron RACI Illuminated Finderscope? Where to find the Celestron RACI Illuminated Finderscope? As always, the best place to shop online for telescopes and accessories is Amazon. While the prices vary, depending on promotions and offers, the Celestron RACI Illuminated Finderscope is currently $99.95 (38% off its original price of $159.95). 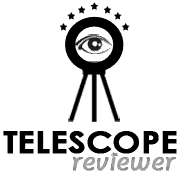 It has an admirable customer rating average of 4.4 stars, with 66% of customers awarding the Celestron RACI Illuminated Finderscope with 5 stars. Another benefit of ordering the Celestron RACI Illuminated Finderscope on Amazon is that you get free shipping in the United States. We recommend that you check out the product on Amazon and read the tens of customer reviews that give you a closer and personal approach to what observing experience the Celestron RACI Illuminated Finderscope can offer you. As the Celestron RACI Illuminated Finderscope is an accessory, there are no major guidelines regarding maintenance. However, you should take into consideration the fact that the Celestron RACI Illuminated Finderscope does not have a dew shield, meaning that it can get a bit clouded up sometimes. Furthermore, several customers explained that the Celestron RACI Illuminated Finderscope can lead to a loss of alignment, so be careful with these aspects. The Celestron RACI Illuminated Finderscope comes with a built-in bracket and requires one lithium ion battery to work, which comes in your Amazon package. There are no additional accessories required for the Celestron RACI Illuminated Finderscope to function. Nevertheless, the most important ‘tool’ related to the Celestron RACI Illuminated Finderscope does not come in your box: the instructions manual. Unfortunately, instructions are not available on the Celestron website, so we recommend that you look through customer reviews for a few tips and tricks. The Celestron RACI Illuminated Finderscope benefits from a one year limited warranty for customers. If you have any inquiries regarding the warranty, you can contact the seller you are planning to purchase the Celestron RACI Illuminated Finderscope from directly for more information. Like we mentioned above, the general feedback for the Celestron RACI Illuminated Finderscope is fine. Customers are very pleased with the fact that this finderscope is so inexpensive, especially compared to other products in its category. The Celestron RACI Illuminated Finderscope is the 12th best-selling finderscope on Amazon, and the customer ratings support the fact that it is a quality product that is worth the minor investment. What customers are unhappy about, however, is the lack of instructions. Most reviews point out this disadvantage and we hope this is an issue that will be solved by Celestron in the near future. All in all, you have every reason to purchase the Celestron RACI Illuminated Finderscope if you are a beginner astronomer (or even an experienced one on a tight budget) who wants assistance with finding celestial objects in the night sky. Being a RACI finderscope, the image shown correctly will greatly aid you in pointing out your targets with accuracy. Also, the fact that you can use the Celestron RACI Illuminated Finderscope even if your power runs out also adds to its value. If you manage to mount the finderscope without instructions, we believe that you will have a reliable finderscope that you can count on to get the job done right. will this finderscope, Celestron RACI Illuminated 9×50 Finderscope, fit on Meade LX90 12 inch telescope? To the best of our knowledge, the Celestron RACI Illuminated Finderscope only works with 10-inch telescopes. The lack of instructions seems to be an industry standard. Recently recieved my 1st scope, a Mac127 and the closest to instructions I got was a sheet of pictures, from which I was able to assemble everything, but I guess I will make good use of YouTube videos to learn as I go. We’re sorry to hear that. Indeed, most telescopes could use more detailed instructions, but the YouTube tutorials are always welcomed. Which Orion finderscope model are you referring to exactly? We’d love to know what you like about it best. Thank you for your input! I think Kevin is referring to the Orion 7020 9×50 Illuminated Right-Angle CI Finder Scope, which has a vixen mount style bracket that could be installed in a great variety of telescopes. The Celestron is a great finderscope, but it seems its mount can just be installed in the SCR’s. Hi. Can you please tell me if this finder scope can be used as a guide scope?